When the HTC U11 was announced, two variants came up — one has 64 GB of storage and 4 GB of RAM, while the other sports a 128 GB storage chip and 6 GB of RAM. At first, it seemed like that latter edition would not be making it to the US, or we had no date for its arrival at least. However, yesterday, it was revealed that the "bigger" model will be landing in the States today. 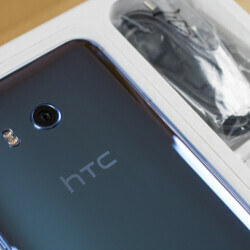 And sure enough, it's already up and ready for purchase on the HTC website! Well, it's a pre-order, that is, which will start shipping in August. The model is also, unfortunately, only available in Silver. Yeah, we think that Volcano Red would've been awesome for the decked-out variant, too. It's priced at $729, which is $60 more than the $649 the “regular” variants would set you back. If you've already bit the bullet and bought an HTC U11, don't feel like you are missing out. 64 GB of storage is plenty and you've still got a microSD card slot, right? And as for the 6 GB of RAM... it's debatable whether that's overkill or not. One can argue it looks more future-proof, but we'd say the day that 4 GB of RAM is “not enough” on an Android smartphone is far into the future. HTC U11 Alexa hands-on: Should the Google Assistant be worried? The best android phone 2017 up to now just got better. Hope this version comes to the uk. For $60 more you got 6gm RAM and 128GB storage compared to 4GB RAM and 64GB storage, that's a great deal and future proof! Next two years is 10GB RAM and 6GB is belong to trash can. They always do mistakes with Math !!! You are Right Its 80 dollars higher not 60 ! !